Most people have experienced anxiety when purchasing goods or services, especially when large costs are involved. Consumers have grown used to paying huge amounts for the privilege of dealing with established and “reputable” companies, whilst many consumers with less spending power are forced to “take a chance” and approach lesser known suppliers of goods or services. There is usually an element of risk involved with consumers not always receiving proper value for their money. The consumer is often in a vulnerable position and left with little recourse after signing unfair agreements. The future is now brighter for consumers and much has been said about the new Consumer Protection Act (the CPA) which has come into force. Many people though are still unaware of the practical implications of the CPA and the new consumer rights which have now become entrenched as part of our law. Below is a list demonstrating a few of the changes which have been brought about by the CPA. The above table shows only some of the unethical practices which have until now been permitted. The consumer- supplier relationship will change in a big way and businesses should strive to use this to their advantage. A more trusting relationship will hopefully emerge which will enable businesses to build long- lasting relationships with their clients. Less ethical companies that exploit unsuspecting or vulnerable consumers will be forced to shape up or close down and this will be beneficial to both consumers and companies that have always looked after their clients’ interests. The CPA is likely to have an adverse effect on property developers who must be careful not to make “innocent” misrepresentations or to sell properties which differ from brochures or on-site displays. 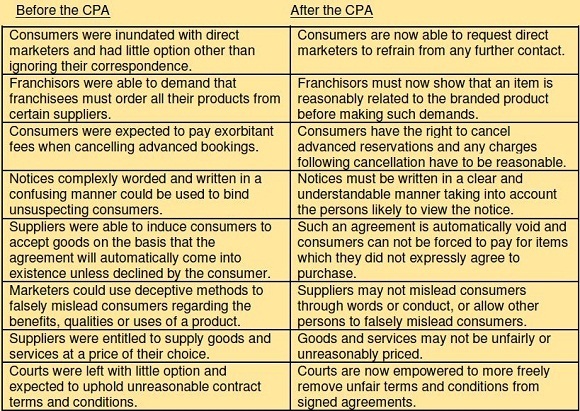 The CPA strives to protect consumers by prohibiting suppliers from providing consumers with an inferior product compared to what the consumer expected to receive. Fortunately for sellers and estate agents the voetstoets clause may still be used for one-off sales, as these sales are not covered by the CPA. Estate agents must however exercise caution if involved in selling a number of units from a new development or any other sale not regarded as a one-off sale. Suppliers and sellers should take extra measures to ensure that their agreements are compliant with the CPA and that any “product” sold is without defect. Please call us if you would like us to assist you with the restructuring of your contracts or if you are a consumer that has been exploited.